On June 5th 2014, I attended the Sackler Center First Awards at the Brooklyn Museum in New York. 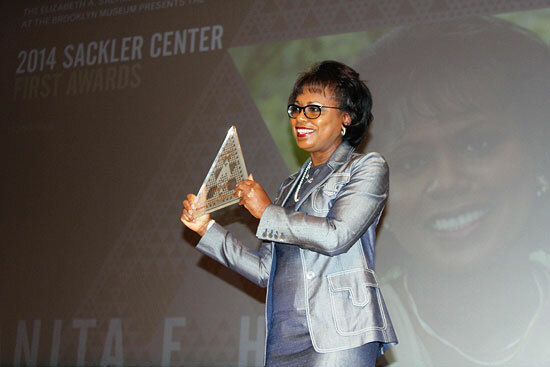 This year, the center honored Anita F. Hill for her very bold and gutsy act in 1991 when she spoke up about her sexual harassment at the hands of the then Supreme Court Justice appointee Clarence Thomas while she worked for him seven years prior, becoming the very first woman to speak to the issue without being deterred or demotivated by the many disapproving voices and threats to her own person or family. 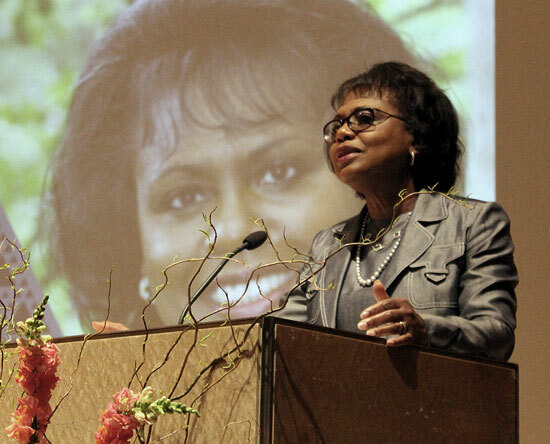 Twenty three years later, the Sackler Center remembers Anita F. Hill as the woman who started a revolution. She spoke truth to power in an America riddled with racial and gender incongruences, and opened doors for women, young and old alike, to do the same when they are sexually harassed in and outside of the workplace. The eight hours it took to drive to and from Brooklyn New York was nothing compared to the fun filled and motivating night the evening turned out to be. A contagious liveliness and excitement filled the museum from the beginning to the end of the event, and the documentary on Anita Hill directed by Freida Lee Mock reminded all in attendance of Ms. Hill’s courage and selflessness. With nothing to gain and everything to lose, Anita Hill came forward about her sexual harassment and saw it through with so much elegance and poise. The film provided the much needed information about Hill’s testimony in 1991, and also gave a behind the scenes look at her life then and now. Speeches from the speakers of the night made it an even more worthwhile occasion to be a part of. New York’s First Lady Chirlane McGray, Elizabeth Sackler, and Gloria Steinem were in attendance, and further reminded those present how well-deserved the award was for Anita Hill. Gloria Steinem went on to coin a term for the Supreme Court Justice Clarence Thomas – “Injustice Thomas” – soliciting a hearty laugh from the audience that was neither the first nor the last of the night. Simply put, inspiration flowed from every corner of the room and rubbed off on many like me who walked away with a renewed sense of purpose in imagining and creating a better world for women. 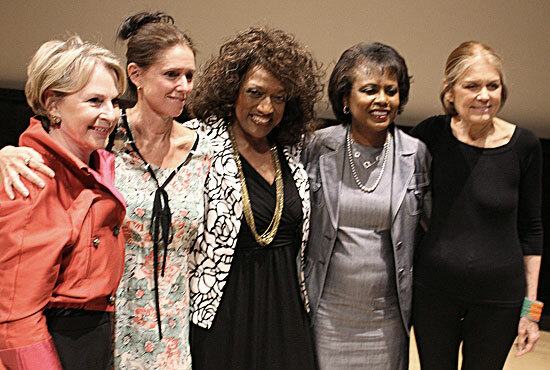 From left to right: Elizabeth Sackler, 2013 Sackler Center First Award winner Julie Taymor, 2012 award winner Jessye Norman, this years winner Anita Hill and Gloria Steinem after the ceremony. Anita Hill’s acceptance speech was nothing but extraordinary. It served as a reminder of the brave, confident, selfless, and elegant woman she was in 1991 and continues to be to date. Although not creative in the sense we are usually accustomed to as artists, her actions in 1991 bear testimony to the most profound form of creativity – she painted the first strokes of women’s empowerment in the workplace on a blank canvas and began a ripple effect that has allowed others to fill the canvas with a vast array of colors and join in the revolution she began. It was, indeed, a night to remember. Anita Faye Hill (born July 30, 1956) is an American attorney and academic, currently a professor of social policy, law and women’s studies at Brandeis University’s Heller School for Social Policy and Management. She became a national figure in 1991 when she accused U.S. Supreme Court nominee Clarence Thomas of sexual harassment while as her supervisor at the U.S. Department of Education and the Equal Employment Opportunity Commission. Despite Hill’s accusations, Thomas was confirmed and took a seat on the Court. Hill’s testimony focused national attention on the issue of workplace sexual harassment. Freida Lee Mock is an American filmmaker, director, screenwriter and producer. She is a co-founder of the American Film Foundation with Terry Sanders. Mock is an Academy Award and Emmy Award winning filmmaker with a range of films on the arts and humanities that include MAYA LIN: A STRONG CLEAR VISION (Academy Award Winner); “Rose Kennedy: A Life to Remember” and “To Live or Let Die” (Academy Award Nominees); “Lillian Gish: An Actor’s Life For Me” (Primetime Emmy Award); “The Kennedy Center Honors Biographical Films” (Primetime Emmy Award); and numerous film biographies including Irving Thalberg and Steven Spielberg for the Academy Awards, Frank Sinatra, Benny Goodman, Elia Kazan, and others for the Kennedy Center Honors. She is a member of the Academy of Motion Picture Arts and Sciences, the International Documentary Association, the Independent Feature Project, and the Writers Guild of America. Yanjanani Leya Kalaya is a senior at Smith College, [Alma mater of Gloria Steinem] where she is double majoring in Study of Women and Gender and Comparative Literature. She has completed research work with professor Naomi Miller to develop a course titled “Shakespeare’s Women, Women’s Shakespeare,” which will be offered at Smith College in 2016. In 2013 she interned at UN Women Malawi, in Lilongwe, Malawi, where she was born. She is currently a Praxis grantee interning at New Observations magazine (www.newobs.org). 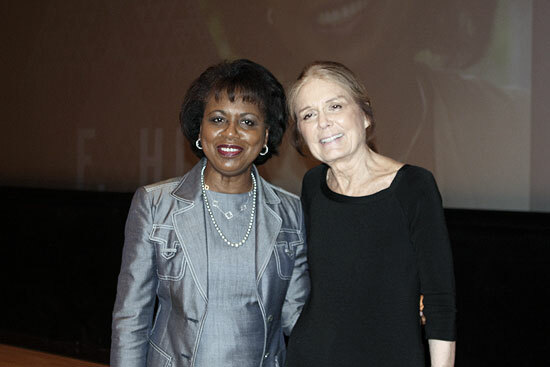 Anita Hill and Gloria Steinem, June 5, 2014 at the Brooklyn Museum.